Washingtonians are going to take a lot of crap for this all season long, but the truth is, it’s been this way for a few years now, at least. Here’s a Washington Post article from 2008, lamenting how thoroughly Pittsburgh Steelers fans claimed FedEx Field for a nationally televised contest. It got so bad that night that Washington, in their home stadium, had to resort to using a silent snap count due to crowd noise. That is comprehensive ownage. That’s as much ownage as a fan group can dispense without running out on the field and giving the home team’s players atomic wedgies. By now, everyone already knows Dan Snyder has had to remove whole sections of seats from the upper levels of FedEx Field to avoid television blackouts. This despite Washington maintaining to this day that in order to purchase season tickets you must join the mythical 200,000-person waitlist. This waitlist was a lie six years ago, and it hasn’t gotten any more real in the time since, during which time Washington’s anemic home crowds have become, finally, a national embarrassment. So, everyone mostly agrees RFK Stadium was a special place, with unique acoustic, spatial, and structural characteristics that made it a noisy and intimidating place to play. Here’s a thing, though: I attended Darrell Green’s final home game, on December 29, 2002, against the Cowboys. I can’t track down any video of the event, but in the middle of the second quarter, Champ Bailey fielded a punt near midfield and, in a predesigned trick play, lateraled the ball to old man Green, who took off for a 35-yard return. To this day, the noise of the crowd when Green took the lateral is the loudest noise I have ever heard. Ear-splitting. Deafening. And that was at FedEx Field! What I’m saying here is this: there was a time when Washington had perfectly respectable home crowds, even after moving to what was first called Jack Kent Cooke Stadium and is now FedEx Field, even after Dan Snyder first took over ownership of the franchise. Now, instead of thinking of the half-teal crowd at Sunday’s season opener as some sort of moral failure by Washington fans, think, instead, not of jersey-clad units of fandom, but of Washingtonians, who are humans, and the universally loathed man atop a universally loathed operation now running the local professional football team. As it happened, I was also at FedEx Field on October 18, 2009, at the very nadir of the Jim Zorn era, when the home crowd was so fed up and disgusted by the interminable decline of the football team that they spent most of the second quarter, every second of halftime, and nearly the entire second half chanting “sell the team.” Most fans gave up on watching the home team trudge through a miserable, spirit-crushing loss to the Chiefs, instead turning and directing their full-throated wrath at the owner’s box. The chant was nowhere near as loud as the insane explosion of sound at the Darrell Green game—the stands were at least half empty—but it was every bit as passionate. Washingtonians’ relationship with Dan Snyder has been one of constant antagonism—dramatic raising of parking and concession prices; cramming partial-view seats into the stadium; suing local publications and freezing out others in response to negative press; deforesting protected land to improve the view at his mansion; ushering the organization through a long series of increasingly desperate and embarrassing defenses of the team’s indefensible nickname; etc. Throughout, Snyder and his organization have rallied an ever-shrinking contingency of totally addled diehard fans to support their cynicism and acts of lunacy. This, in a way, is NFL (and sports) fandom in microcosm: loyalty to this thing has the power to influence and distort moral equations and personal politics, maybe even entire worldviews. Here’s what I mean by that: protests over the team’s nickname aren’t remotely as new as its defenders would have you believe. Last year, Dan Steinberg and Fred Hiatt of the Washington Post pointed to protests of the name that stretch back at least as far as 1971. The National Congress of American Indians gained national attention for actively protesting the name in 1988. The issue came to my attention for the first time in 1992, when protesters held actions against the name during the week of the Super Bowl. My parents were aware of the controversy, I was aware of the controversy, and I never forgot about it. I did, however, put off caring about it for nearly two decades, because I was loyal to the home team. Eventually, my conscience caught up. There are, of course, those who will die before they ever seriously consider what it means that a prominent American professional sports team has a racial epithet as its official nickname. 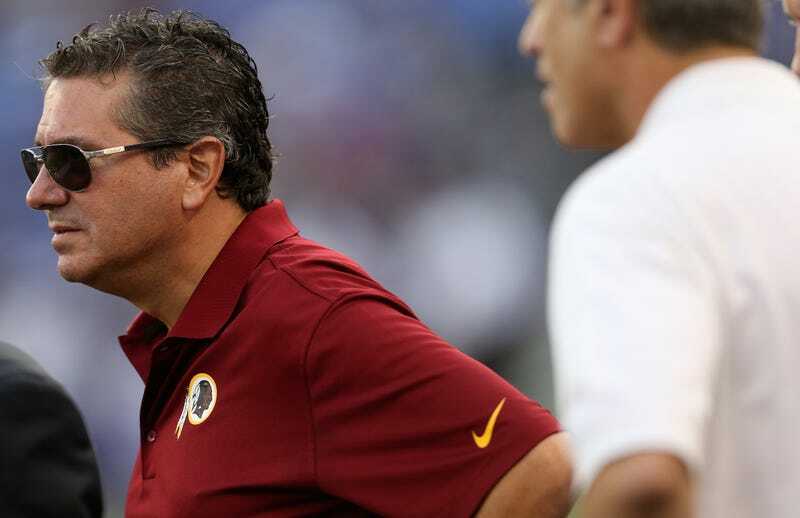 Dan Snyder is just the most recent face of those defending the name. But when you ask fans to support something as hideous as a racist nickname, amid expanding public awareness of the meaning and history of the name, you will lose some of them. When Jack Kent Cooke moved the team out to a hellhole nowhereburg in Prince George’s county, he lost some of them. When the new owner was found to have brazenly defied local ordinances to improve the view from his mansion, he lost some of them. When he meddled (and continues to meddle) in football operations, he lost some of them. When the organization fails, year after year, to produce even a minimally respectable football team, they lose some of them. When Snyder and his inner circle sneer and lie and bully and in all other ways disgrace themselves and their organization and that organization’s fans, they drive conscientious fans away in droves. It’s true that fans will put up with a lot, but this is really a truth best visualized in concentric circles. The outermost circle of fans will put up with everything up to, say, the team being garbage. Somewhere inward from there are fans who will put up with the team being garbage and other manner of disappointments and indignities, but cannot abide a racist nickname. Somewhere inward from there are fans who will shrug at a racist nickname but will not be able to root for a team with as arrogant and defiant and meddlesome an owner as Washington’s. Maybe somewhere at the very center of this is some guy who would not stop rooting for his team even while everyone on the team’s payroll took turns stabbing him with an actual chef’s knife. Most fans will put up with knowing the NFL is brutal and dangerous and corrupt, but will enjoy hating and rooting against a team as gross as Dan Snyder’s. That team has crossed some imaginary line beyond which all but a small number of fans cannot follow. You already understand this. A lot of this is exactly why you delight in watching Washington’s football team crash and burn, why you are happy to see them lose spectacularly and suffer public humiliation. Here’s the thing: many Washingtonians are right there with you. They’ve had a front row view of one of the most despicable human beings on earth running wild and unchecked over everything in sight, wearing just the thinnest token veneer of self-awareness and perspective and humility, just enough for the rest of us to take it for the insult it is. Washingtonians hate him. Their desire to see him fail is stronger than you can imagine. For an increasing number of them, the desire to see Dan Snyder lose is stronger than their desire to see their favorite football team win. So, the embarrassment for Washingtonians isn’t that so few of them forked over hundreds of dollars to sit in a soulless corporate-branded hellhole in the absolute middle of nowhere to watch the home team’s most recent progression on an endless timeline of grueling self-destruction, nor that they were overwhelmed by fans of a team whose stadium is 1,049 miles away. The embarrassment is that there were any Washington fans there at all. Chris Thompson is a freelancing dude who lives in rural Virginia. His stuff’s been here and Vice Sports and Truth About It and The Classical and Gawker, too. Find him on Twitter @madbastardsall.